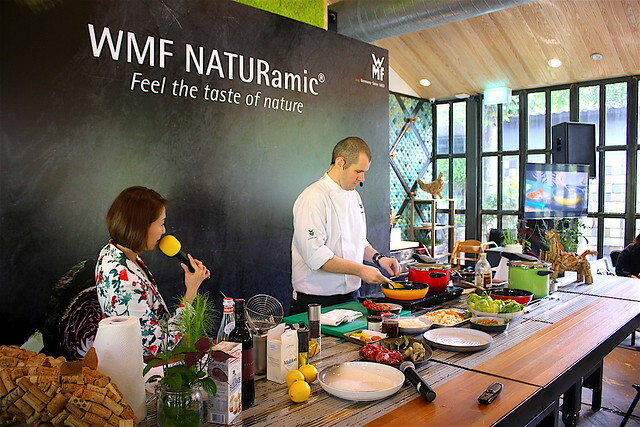 WMF has launched NATURamic®, a premium high-tech range of ceramic cookware that cuts cooking time and helps retain the natural taste of ingredients. Made with technologically advanced ceramic with a steel core, the WMF NATURamic enables uniform and fast heat conduction, and optimal heat retention. These are also nickel-free, making it safe for preparing baby food and for people allergic to nickel. 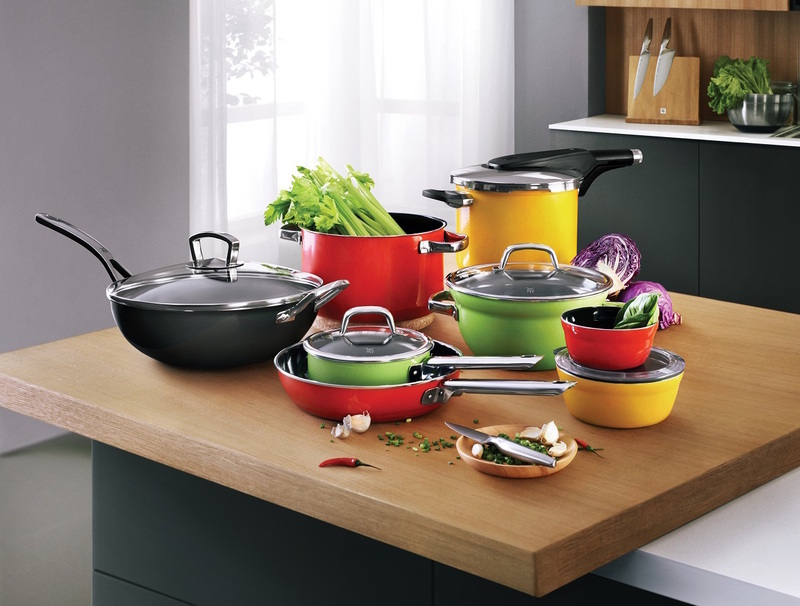 The smooth, non-porous closed surface ensures that there are no residual flavours from previous cooking sessions. It's cut- and scratch-resistant (yes, bring out your metal utensils without fear! ), so that minimises the risks of it becoming a bacteria breeding ground. Less oil is also required, so you can enjoy more healthy dishes. On top of that, the beautiful colours are the perfect pop of colour for the kitchen. 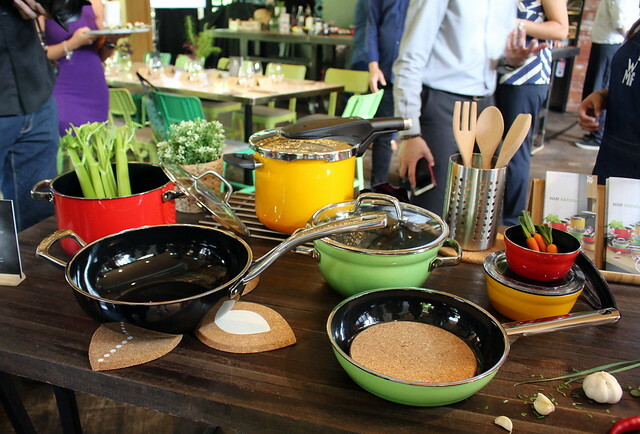 I saw the range during the launch event and totally love the solidly built cookware. They are so durable, WMF is giving a 30-year warranty. Man, looks like these are the only pots and pans you'll ever need to buy for life. 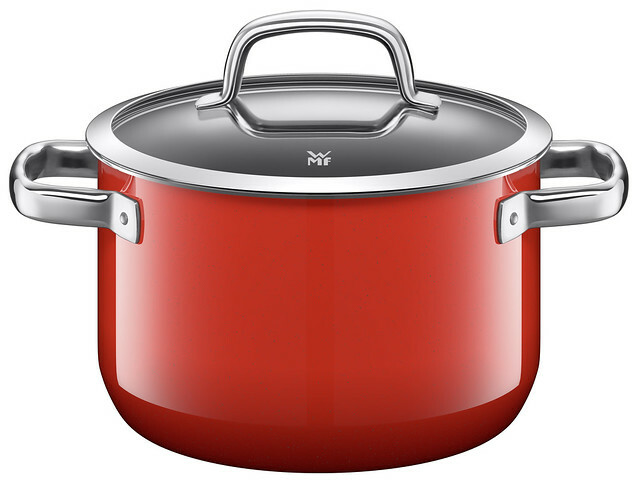 The pressure cookers drastically shorten cooking time by 70% and energy by up to 50%. The nutrients and flavours are also better preserved thanks to the gentle cooking method and hermetically sealed lid. A one-touch dial system and maintenance-free valve system means fuss-free user-friendly cooking. The handle is detachable, making the lid easy to clean. Suitable for all hobs. This multi-functional pot lets you cook and serve your food in the same pot, so you save on washing up. Ovenproof and helps keep food warm too. 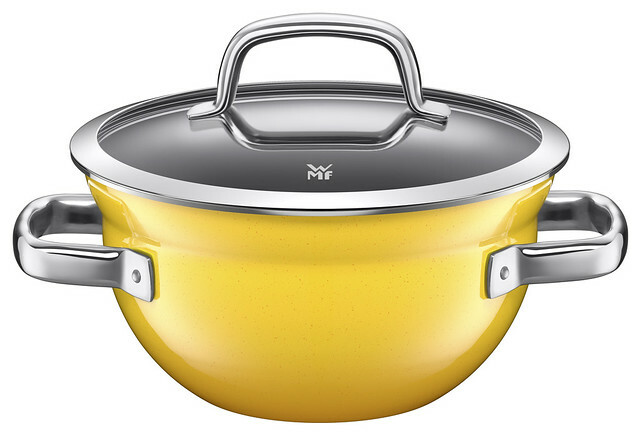 Great for making soups and stews, the High Casserole features hollow handles and a heat resistant glass lid which make for comforable holding even when cooking for long periods of time. These pretty bowls are ideal for preparing, cooking, serving and storing food. 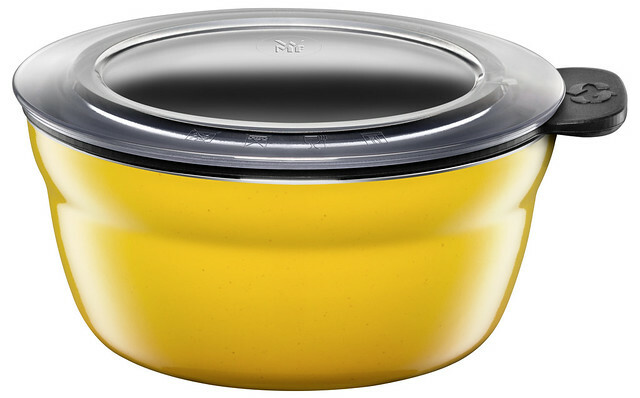 The natural ceramic materials with steel core allows rapid heating (or reheating) and it also comes with an airtight lid. 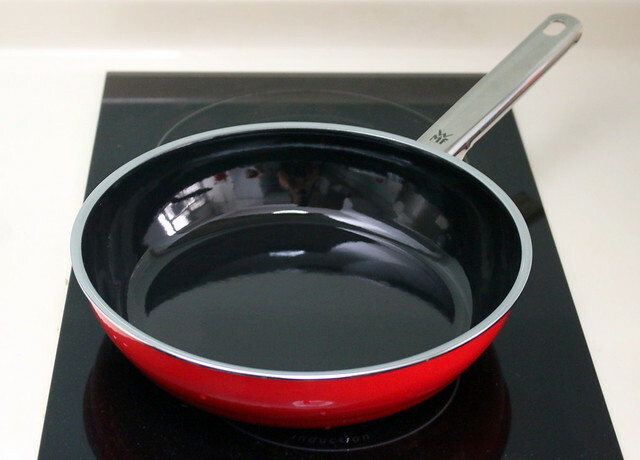 The frying pan is ideal for frying foods at high temperatures. 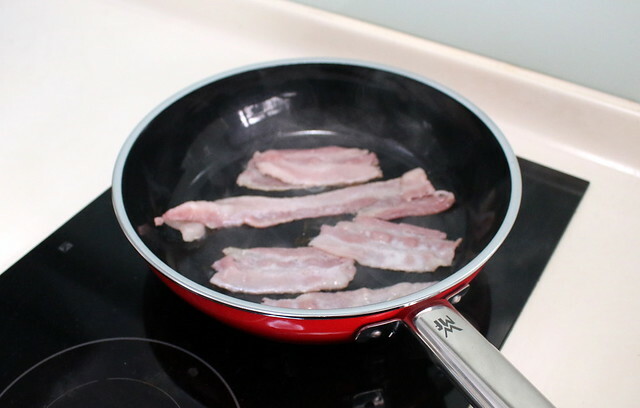 The steel core allows the whole pan to heat up quickly and evenly. The smooth surface also means you don't need as much oil for cooking. 1. Cut the Romaine Lettuce in half. Preheat the WMF NATURamic Frying Pan and roast the salad on the flat side. Toss and salt and black pepper. Keep aside. a) Coat half the chicken oysters with flour, egg, breadcrumbs and deep-fry them. b) Preheat the WMF NATURamic Frying Pan and roast the remaining half of the chicken oysters until all sides turn brown. Reduce the heat and add Chicken Jus. Finish with a small knob of butter, freshly chopped Italian Parsley and Chives. 3. 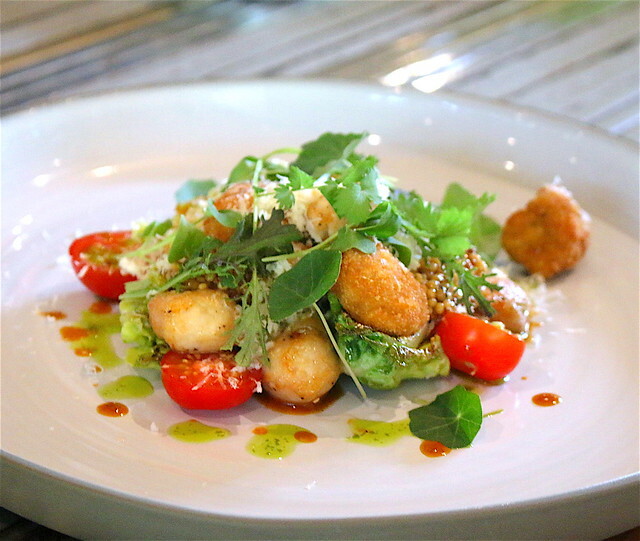 Place the salad hearts onto a plate and add the fried and braised chicken oysters. 4. Top with freshly grated Parmigiano Reggiano, freshly grated Horseradish, a few vines of Cherry Tomatoes, Mustard Caviar and fresh herbs from the garden. 5. Lastly, drizzle with parsley oil. WMF gave me a NATURamic Frying Pan to try for myself. I have to say it is really beautiful. And heavy too! I'm going to have nice biceps and triceps after flipping omelettes. What food do I test it with first? 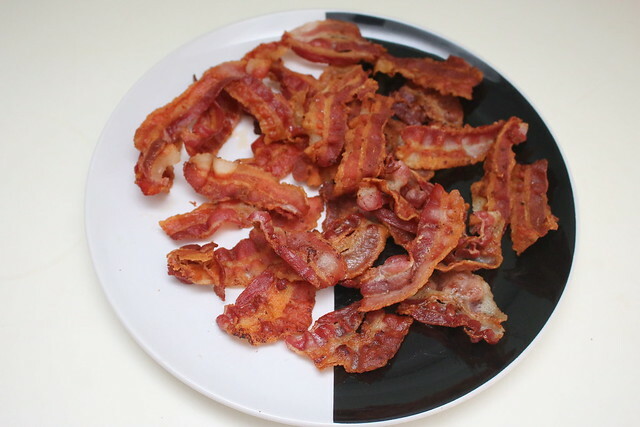 Bacon, of course. Right off the bat, I was impressed with how fast the pan heated up with my induction cooker. The heat is indeed very even across the pan, and the food does not stick! It was really easy to lift the pieces off. The food also gets cooked more quickly than usual. You really have to keep an eye on it, but you do get everything done faster. Thanks to WMF for the invite to the launch event. Photos 1-6 courtesy of WMF. Hi Ana John, I think you might need to clean the pan a bit better? If food is sticking, there might still be residue from your previous cooking. Try a little baking soda if the food stains are stubborn?